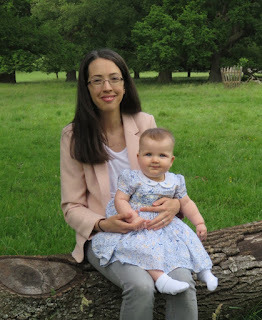 At the beginning of June we took an early evening walk at Killerton House and Gardens. 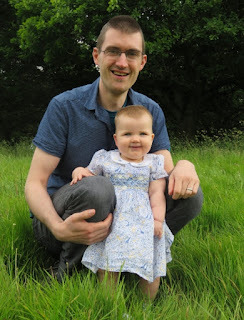 Katie wore a new dress and enjoyed standing in the grass and exploring another log. Katie loves nothing more than to giggle and smile, but since the day she was born she has struggled to do so once the camera has come out. Not this day! A week later we took our car in for its MOT and it never came back. 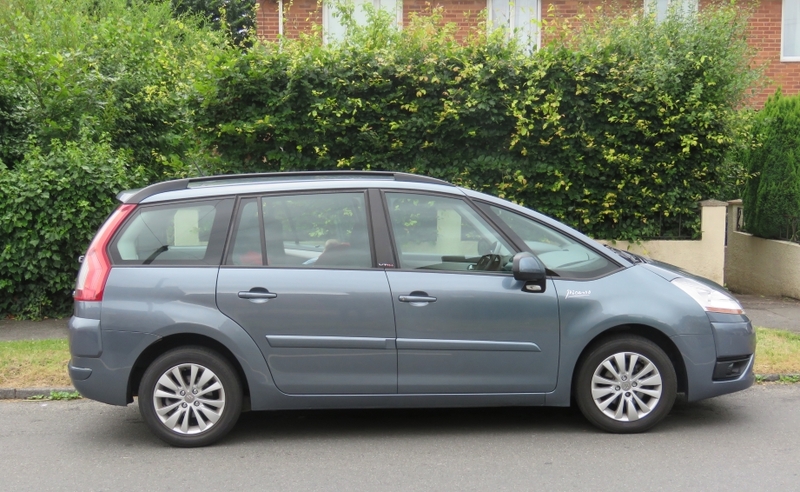 By the end of the month we had bought another car, but in the meantime we weren't able to get out for any trips to the countryside. We did spend lots of quality time with Katie at Frog End. 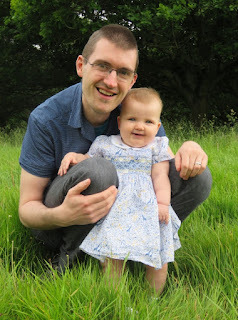 There was a heatwave, which meant that she spent over a week wearing just a nappy and we spent the week opening and closing windows and curtains in an attempt to cool down the house. 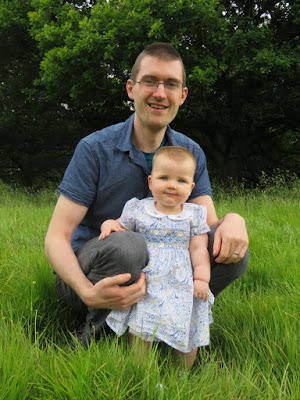 The weather then gradually cooled down and on the day we bought the new car the heavens opened. Katie became extremely mobile this month, creeping, pulling herself up into a standing position, cruising all around the study and lounge and climbing all over everything and anything (especially Mummy and Daddy). 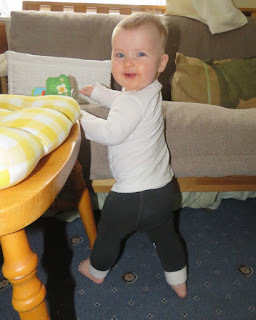 She finally learned to pull herself up into a sitting position, which has made bedtimes more interesting as she tends to instantly abandon lying down in favour of sitting up and looking around. 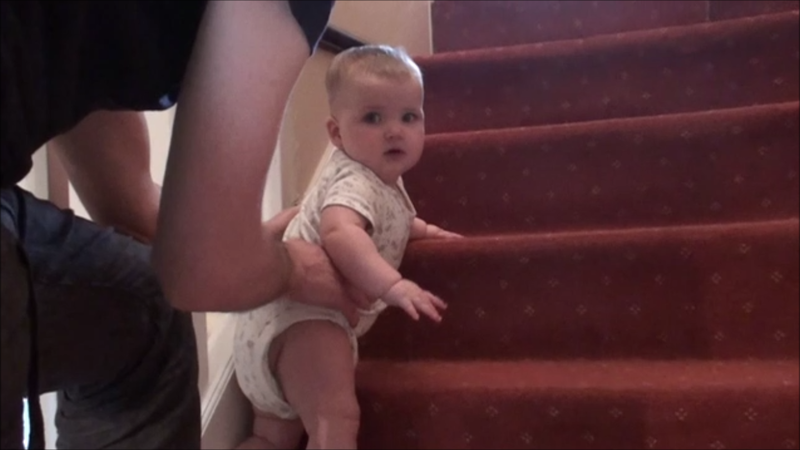 She even learned to climb the stairs (with Mummy or Daddy close behind to make sure that she didn't fall). Katie loves her food, especially breakfast. I'm not sure if that's because it's sweet (she usually has cereal with fruit) or if it is simply because she hasn't eaten for so long. 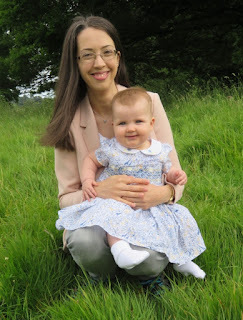 She even likes conversations about food (though to be honest the giggles usually appear whenever Mummy does a silly voice). Veg: lambs lettuce, cauliflower, watercress, pak choi, turnip, little gem lettuce. Fruit: red cherry, pomegranate, lychee, gooseberry, nectarine, lemon, black cherry, pineapple. Grains: wheat berries, red rice, green wheat, black barley, arborio rice. Pulses: kidney beans, pinto beans, flageolet beans, cannellini beans, aduki beans. Nuts & seeds: walnuts, buckwheat. Others: green pesto, nutritional yeast, houmous, shiitake mushrooms, margarine. 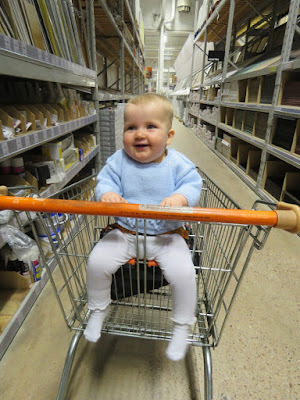 For her first trip out in the new car we took Katie to B&Q. She sat in a child's trolley seat (as opposed to a baby one) for the first time and had a wonderful time looking around the store. Next month, Katie will have another visit from Grandpa and will meet Great Uncle GB for the first time. We are warning you both in advance that she likes all things that are expensive, breakable and if they're dangerous too then she considers that to be a bonus (e.g., glasses, phones, tablets). 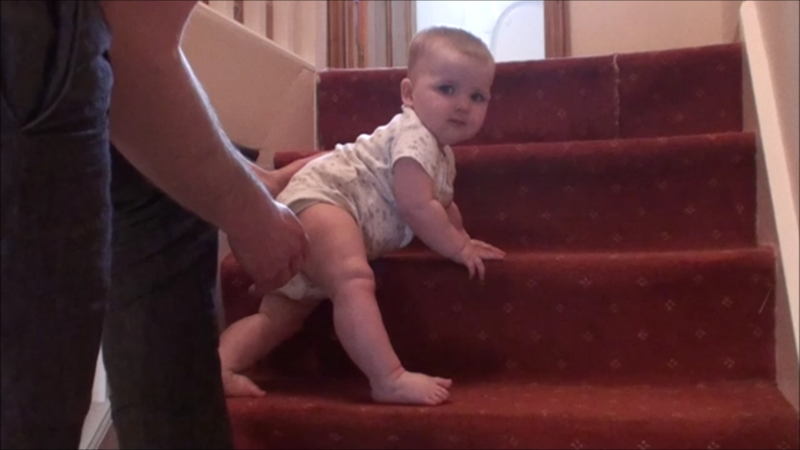 To be fair she's only destroyed a remote control and a door stop so far, but we have to be extremely vigilant!